The story also ran within the week in the Lubbock Avalanche-Journal (Texas), the Lawton Constitution (Oklahoma), the Ada Evening News (Oklahoma), the Port Arthur News (Texas), the Odessa American (Texas), and the Northwest Arkansas Times. 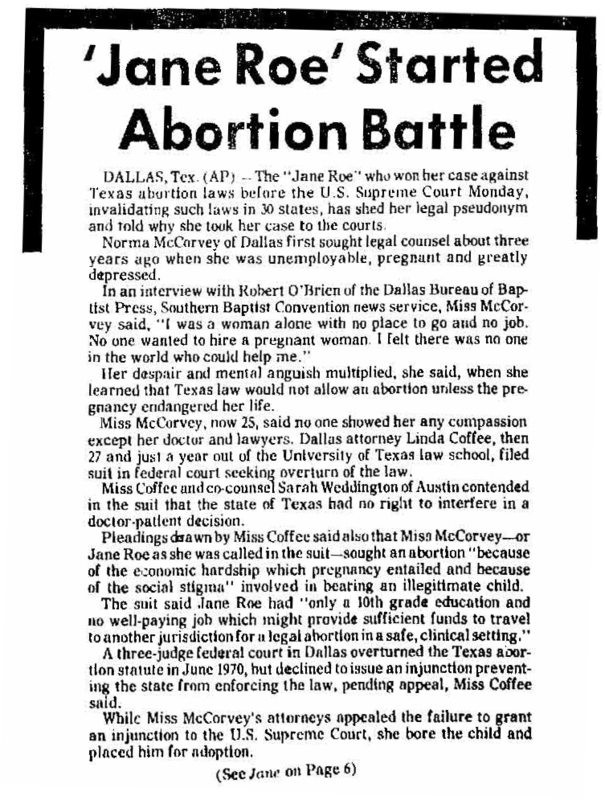 However, as noted in Liberty and Sexuality Since Roe v Wade, McCorvey’s identity then “receded into full anonymity for most of the ensuing decade.” Accordingly, some 1983 newspaper articles marking the 10th anniversary of the Supreme Court’s decision erroneously indicate that McCorvey did not reveal her identity until 1980; a 1995 Newsweek article claims it as 1984; this internet source says it was 1989; and the Amazon editorial review of McCorvey’s first book suggests that it was 1993. Afflicted as I am with some form of multiple personality disorder (or so Beelzebub advises me) I am reminded of the similar confusion over the “coming out” date of Shirely Ardell Mason — the woman upon whom the 1974 book “Sybil” was based. A psychiatric historian, Peter Swales, proudly announced her name in December 1998, about ten months after she died. As it later turned out, some people from her home town (Dodge Center, Minnesota) had figured out Sybil’s identity from various descriptions in the book, and the Minneapolis Star ran a story naming her and her parents in August 1975. Although that story was also picked up by Variety, it was collectively forgotten and Swales’ “revelations” nearly 25 years later came as a surprise. Wow! I stand in Awe. Not to speak for Satan…er…Beelzebub…but he never said anything about MPD, and he never attempted to diagnose you. He did, however, express what I think was some legitimate concern for your well-being. Well, at least I’m relieved to see a few cogent sentences strung together in what appears to be coherency. So, if I may be so brash, I take it that it was moral rumination on abortion, more than anything else, that was responsible for your conversion? Wow, this place is dead. I guess this is what happens when you concentrate for 3 weeks straight on inane puns. Interesting. I had no clue that she revealed herself so soon after RvW.